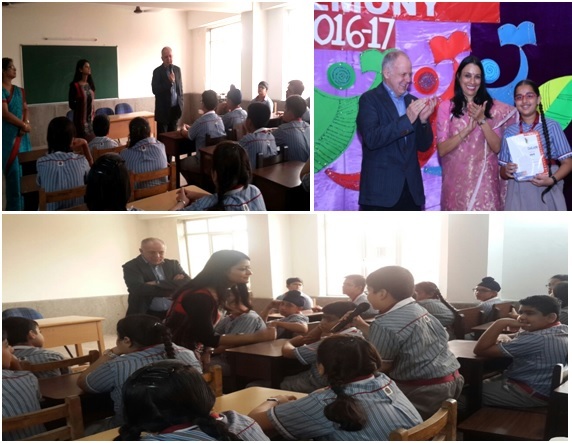 K.R.Mangalam World School, Vikaspuri conducted Class VII Scholar Badge Ceremony on July 27, 2016 and the occasion was graced by our esteemed Guests, Mr. Carl-Jochen Dill, Head of Educational Services accompanied by Ms. Hema Gupta, Project Manager Educational Services, Max Mueller Bhavan, New Delhi. After felicitating our scholars, an interactive session of Mr. Dill with the young German language learners took place where he discussed with the students about the advantages of learning German as a foreign language, Germany as one of the destination for higher studies. The students were very enthusiastic and had put many questions about German as a foreign language and Germany. They felt more confident after interacting with a native German speaker and seemed very curious to learn about Germany as a country. The whole session was very informative and infused lot of interest about German language.